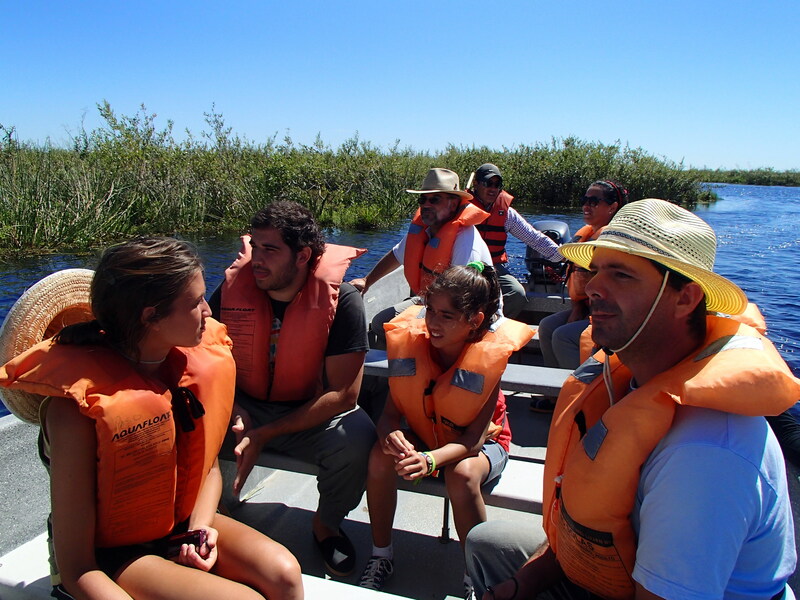 In a world reeling from the bad news of one environmental disaster and natural resource pillage after another, Argentina’s Esteros del Ibera Wetlands National Park stands out as a heartening example of the resiliency of ecological communities. It’s a story of one community’s relatively recent recalibration from an economy based on harsh exploitation of natural resources to one based on sustainability and coexistence with nature. A reasonable definition of sustainability encompasses the long-term maintenance of well-being, with environmental, economic, and social dimensions. The Village of Colonia Carlos Pelligrini is making a case for succeeding on all three fronts. 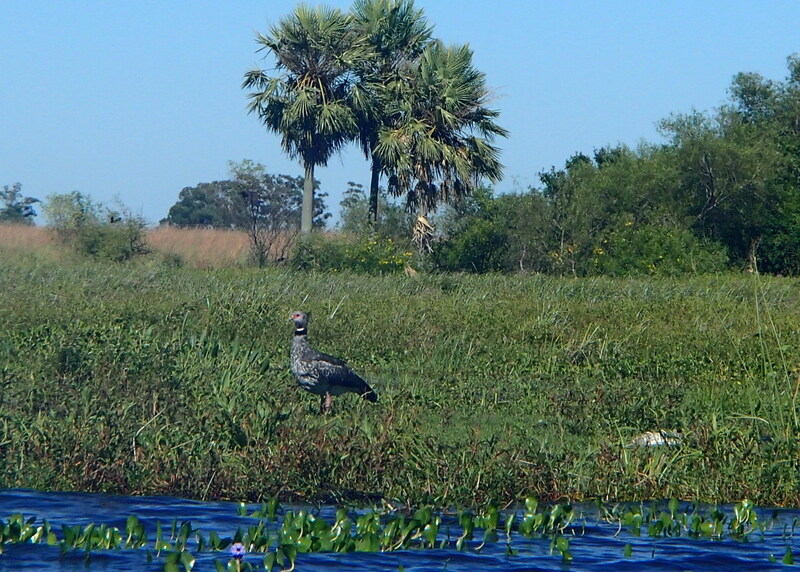 In the early morning of a summer day in late January, the air is fresh and sweetly rich with the aroma of tropical blooms in the seemingly endless wetland that is the Esteros del Ibera of Argentina. The air also is surprisingly cool given that the days are oppressively hot and calm. I think of other “exposed” regions I’ve visited, like the Arctic tundra, America’s great plains, the pampa’s of Uruguay, and beaches throughout the Americas – they’re windy places, right? Maybe this is a seasonal doldrums or something – four days here and it seems like the wind rarely gets strong enough to ripple the water. This translates for me, and it seems like everyone else, to slow afternoons that are spent hiding in the shade. A boat ride along the shores of the Ibera lagoon and its many channels under a brilliantly clear blue sky reveals shades of green on the marsh that are diverse and vivid, forming a richness of palate that sings for you to take up oil-color painting. 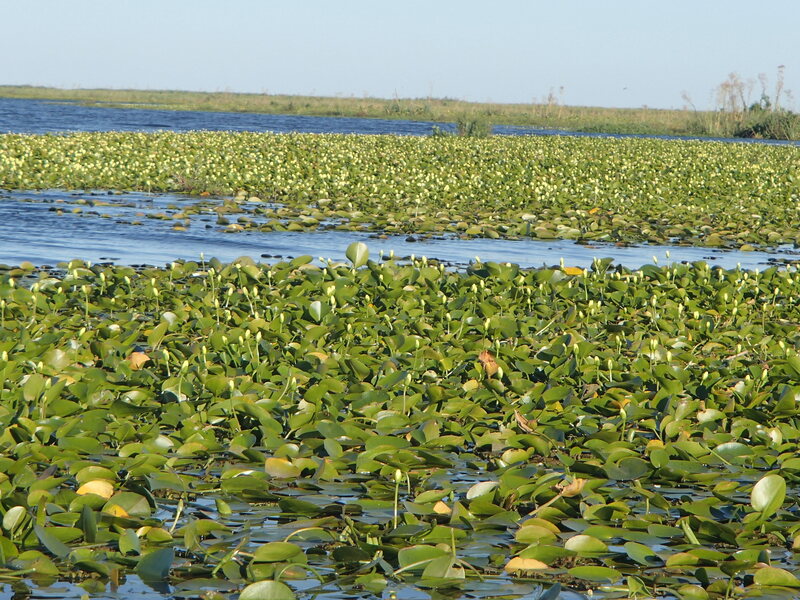 The yellow-green of round pond-lily leaves carpet large areas on the surface of the water, making perfect ballroom floors for the wading bird called jacana’s to dance upon. The yellow lily flowers are held tight in their blossoms this morning, but are peeking just enough to hint at the bright yellow brilliance that would unfold later in the heat of the day. Above the water surface, in a diverse “skyline” above and across the marsh surface that seems the same in no two places, splashes the olive green of arrowheads and marsh grasses, the darker green of smartweeds, and a yellow to forest green of the many species of shrubs and trees. Ecologists call this “optimal habitat heterogeneity” to describe how variable the plant structure is and how good it is for wildlife. 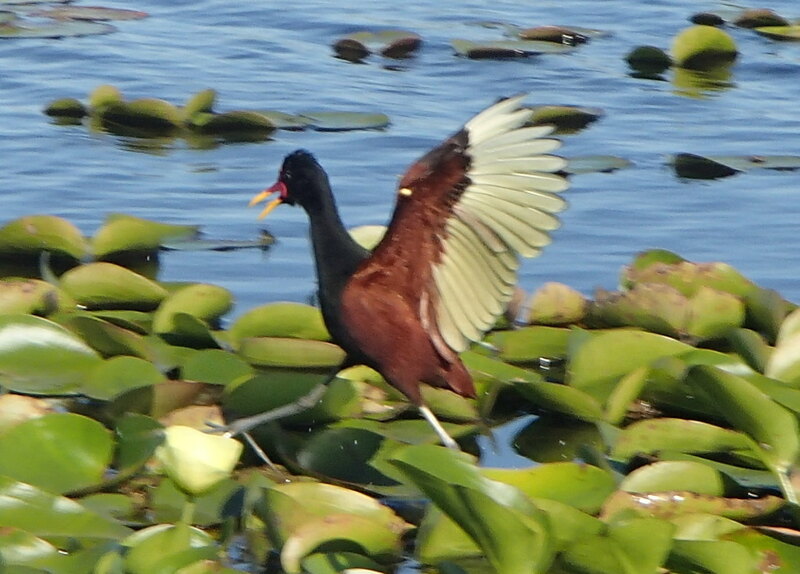 A Jacana dancing on its’ ballroom floor. Swallows are beginning to swarm above the marsh, chasing flying insects that had soaked up the morning sun and taken flight. The chattering of the swallows, rusty hinge squeaking of blackbirds, and monotone ringing of frogs add the busy background music for a soundtrack that’s accented by periodic piercing wails of screamer ducks, scolding cackling of jacanas and herons, and harsh sounding off of kiskadee flycatchers. Capybara in all its glory. The first time our naturalist guide Jorge pulls the boat up to a capybara, everyone in the boat is awed by the size of this mega-rodent and by how oblivious to human presence they are. Adults are as big as a medium-sized farm pig, but with much greater curb-appeal and charisma, having comical square faces, tiny ears that seem like they’d be more at home on a squirrel, and rounded tail-less hind quarters. After 20 or so of these encounters, and others where you hop out of the boat onto floating islands and stand in the midst of entire family groups of capybaras, the novelty begins to wear off, but not the surrealism of the experience. Capybara’s hanging out on a floating island. The Esteros del Ibera is one of those “the earth has too few of these” places that makes you feel exhilaratingly alive as you drink in its freshness. It is a largely intact wetlands wilderness of over 13,000-sq km (5,000-sq miles) of aquatic plants and grasses, freshwater lagoons, and interwoven river channels, on par with the more famous Pantanal do Mato Grosso of Brazil. Trees grow on islands, a large number of which are floating intricate weavings of dead and living plant roots and shoots that form deep mats in the water; these islands are called embalsados. 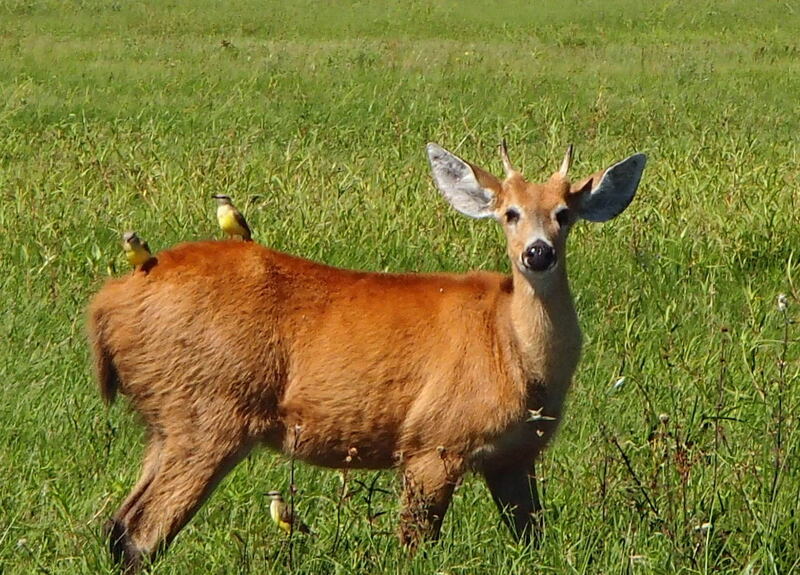 The wildlife community is wonderfully diverse, with over 350 species of birds, mammals like capybara, neotropical otter, swamp deer, the maned wolf, and reptiles like the caiman and anaconda. The ecological web of life is largely intact here, from the tiniest floating plants and swimming insects, through the herbivores and insectivores, to omnivores and carnivores, each species contributing to the well-balanced and ecologically resilient whole. 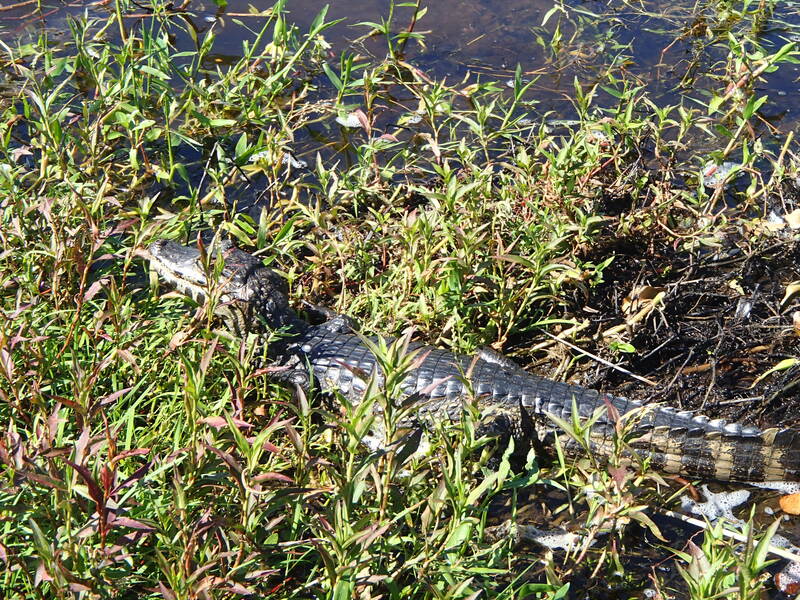 In a healthy system like this, controls are “built-in.” Too many capybaras, and those plant species favored by these grazing animals would disappear, but adult caiman help to keep capybara numbers in check by feasting on their young. In turn, Jabiru storks help to keep caiman populations under control by feasting on their young. Back on solid ground, the roads of the small Village of Colonia Carlos Pelligrini, which is located entirely within the park, look and feel like they were carved out of the wilderness a week ago, just enough time for it to have rained and allowed fresh rutting of the new surface. The ‘pavement’ is simply the upturned and bulldozed sandy soil, maybe with just a small extra layer where the shallow roadside ditch was dug out and the soil dumped onto the road. The only establishment signs in the village are small and hand painted. Most of the buildings, small one level structures of wood and concrete, seem to be no more than 5 years old, and the residents move about with a positive energy and outlook that, again, seems to indicate that Pelligrini’s bread is just out of the oven, with no mold in sight. I was surprised then when Bruno, our guide for our caballato (horse) tour, detailed a history for Pelligrini dating before 1900. For all but the last 25 years, this was a village soaked in the blood wrung from the animals harvested in the surrounding Esteros del Iberia. Prior to 1983, a visit to this region – if you had any reason to visit – would have revealed a much different scene. Pelligrini was a “mining” area for the world of fashion. Caiman skin made wonderful purses and shoes. Feathers from egrets and storks and other species were highly sought for hats. Capybara leather was good for all kinds of things. Wolves were shot because, well, they were wolves and humans don’t like to compete with predators when their living depends on the abundance of the same animals that predators eat. A caiman, happy to be hanging onto its’ skin. The exploitation was large enough to support a local population of several thousand people. With little dry land and poor soil for farming, there was no other reason for people to live in Colonia Carlos Pelligrini. The impact on the wildlife resources was severe, and the ecology of the Esteros was teetering on the brink of collapse. 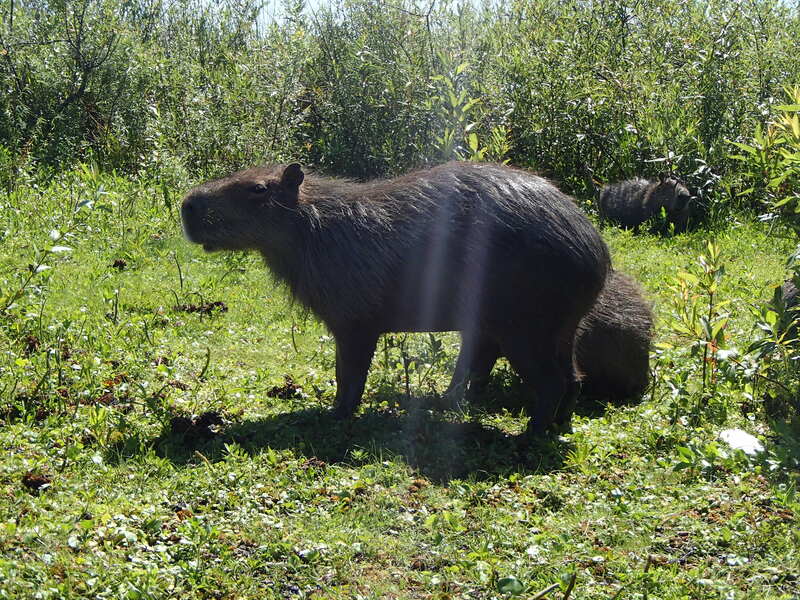 Remove capybaras and vegetation chokes the open water areas. Remove caimans and it throws the balance off in the fish community. Like every ecological community on earth, take away one component and every other component is affected and the overall system is weakened. Remove enough and that system collapses. 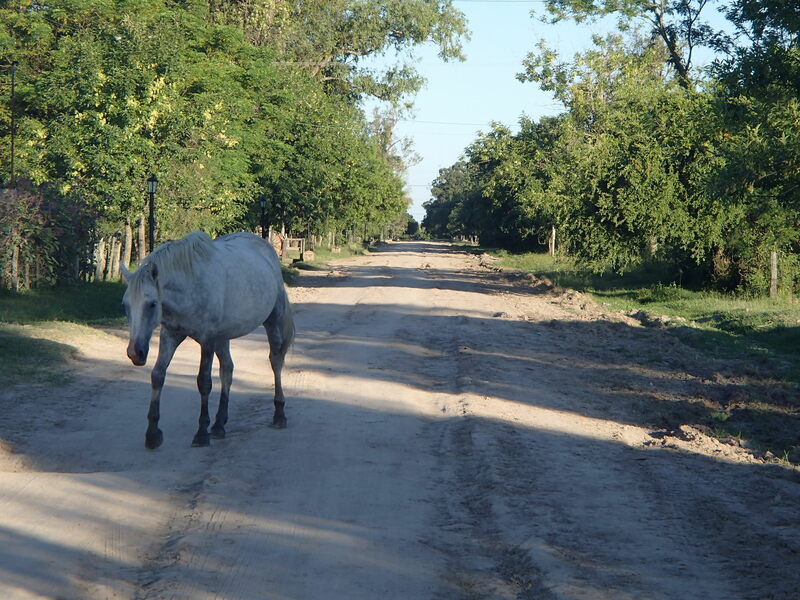 When Argentina designated the area as a park and outlawed hunting in 1983, the human population of Pelligrini dropped precipitously as residents lost their livelihood. It’s been a slow and gradual recovery, but Argentina has invested in the infrastructure and promotion of the region, and the residents that stayed, and those that have arrived since, have reinvented themselves within the ecotourism industry. The town, now home to around 650 full-time residents, abounds with hostels and posadas, tour providers, and modest ‘gastronomicas’ (eateries) serving carne or pollo de la plancha and ensalada. 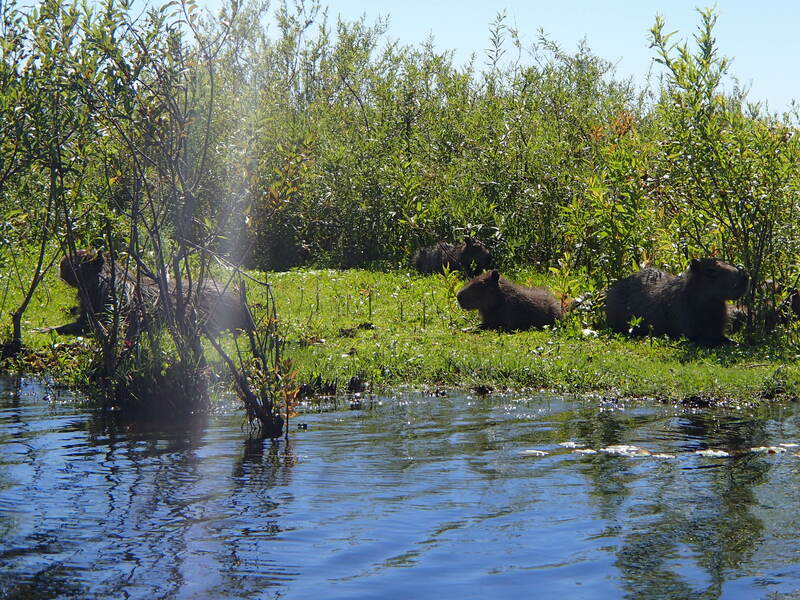 You can take boat rides throughout the lagoon that get you close enough to capybaras to smell their musky rodent perfume, and close enough to the long-legged swamp deer to make out individual items of food they munch on as they wander up to their bellies in water through the marsh. Small group boat tours that get you up-close. Community pride runs high. To Bruno, the gaucho caballato guide, Pelligrini was now a special place to live, where everyone in town was his friend. Tourism increases every year, and, far from hectic, Pelligrini makes for a “buena vida” (good life). Visitors discover that no one is “in your face” to sell you anything, and in fact for long stretches in the mid-day, it’s hard to find anyone to sell you anything at all, no matter how badly you want that dulce la leche helado (ice cream). The ghost town feel changes when the sun sets around eight o’clock and the searing heat loosens its grip – it’s about that time when families and friends gather on porches and go for strolls, and restaurants finally open for dinner. My daughter and I met and went on several tours with an Argentine family who were on their first visit to the Esteros park as well. Felipe is a 22-year old college student studying to be a writer, hopefully on the political scene. When asked about what the park meant to him, he explained that it was a general value as opposed to an Estero-specific one. 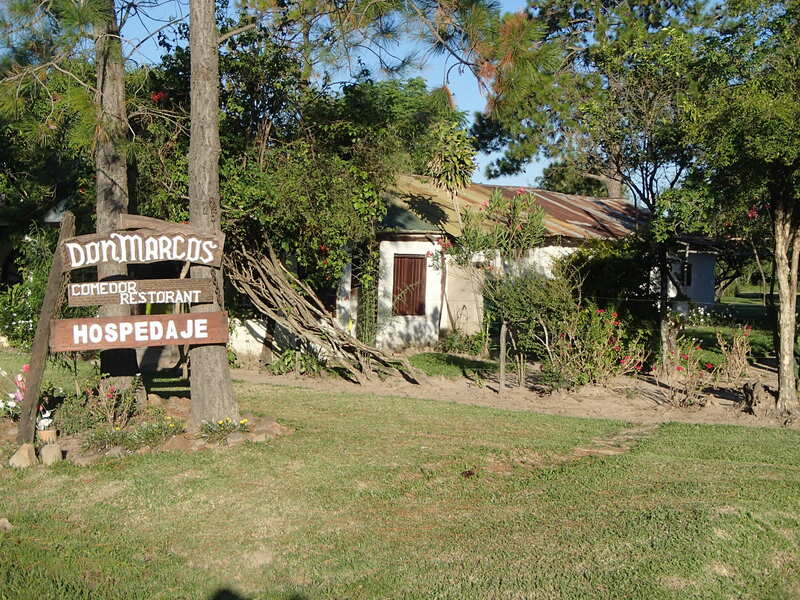 Esteros, like other natural areas throughout Argentina, was providing him with many fond memories of time with his family, and it was adding to his already-keen sense of national pride and awareness of the natural beauty of his country. Let’s see…a stable and peaceful community, valued and respected by outsiders, built upon a foundation of sustainable dependence on a healthy environment, with clean air and water, abundance of nature, and lacking in commercialism. I sensed from my visit that Pelligrini probably doesn’t have to worry about overdevelopment of its tourism niche. The road in is being improved and that will probably translate to more visitors, but Starbucks and McDonalds won’t be moving in anytime soon. The wetlands experience is wonderful, but it doesn’t have the mass market appeal of a neighboring tourist attraction not far to the north – the world-famous Iguazu Falls. Not every community has an ecological attraction like the Esteros del Ibera or Iguazu Falls to “develop” and base a sustainable economy upon. Luckily, the principles of sustainability don’t rely upon a tourist attraction to succeed, and all communities can benefit greatly from incorporating principles of sustainable economies into their planning. Examples include local food production, renewable energy, sustainable development and land use planning that has a long term focus, along with community event programming. Sustainability, like that implemented by Colonia Pelligrini, is a way of life we all can live with. A screamer watches over its nest.